Most people only know about Kartavirya Arjuna as the thousand-armed king who was the villain of the story of Vishnu's incarnation Parashurama. Kartavirya Arjuna stole the divine cow Kamadhenu from Parashurama's father Jamadagni, so Parashurama cut off his thousand arms and killed him. 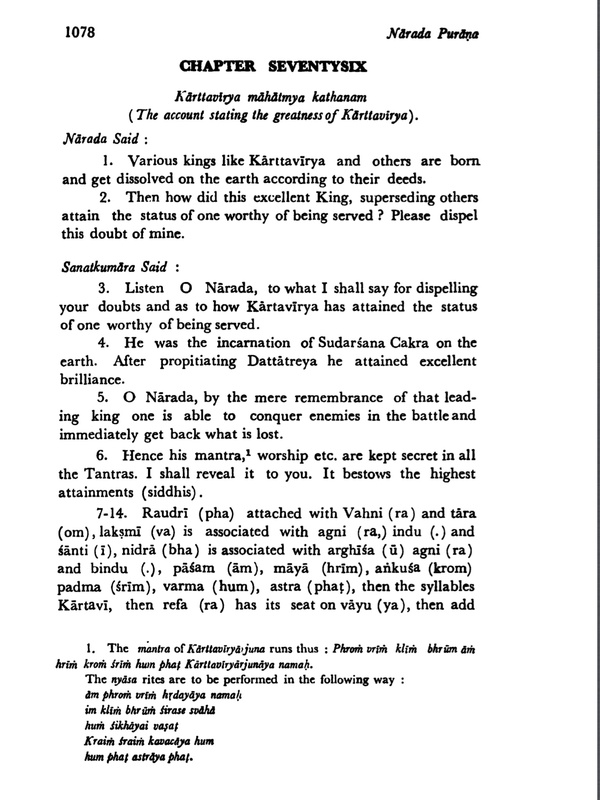 In response, Kartavirya Arjuna's sons killed Jamadagni. To avenge his father's death, Parashurama annihilated the Kshatriyas of the Earth, who had become corrupt, 21 times, as I discuss in this question. He was the incarnation of Sudarshana Chakra on the Earth. After propitiating Dattatreya he attained excellent brilliance. Indeed Kartavirya is the incarnation of my discus, on the surface of the Earth. He has finished his assigned task, O excellent Brahmana. Finish him, O bestower of honor. So my question is, why did Vishnu's Sudarshana Chakra incarnate as Kartavirya Arjuna, an enemy of Vishnu's incarnation Parashurama? The only story I have come across (given in this webpage, for instance), goes roughly as follows: The Sudarshana Chakra become too arrogant, and brags that Vishnu is only able to achieve his great deeds because of the Sudarshana Chakra's help. So Vishnu curses it to be born on Earth, saying something like "You will be born as a powerful king, and you will have the same thousand arms that you currently have. I will be born as the mere son of a sage, and I will defeat you." But are there any scriptures that describe this story? From the Wikipedia article it appears that Kartavirya Arjuna was born from a boon from lord Dattatreya (collective incarnation of Brahma, Vishnu, and Mahesh) to his father Kritavirya, rather than a curse from Visnu to his Sudarshan Chakra. The king (Kartavirya Arjuna's father) was very happy to hear this. Naturally he asked for the son he had desired for so long: 'O master of the universe, O killer of the Madhu demon, kindly grant me a son who will never be conquered by demigods, human beings, snakes, demons, or hobgoblins, but whom only You can defeat.' The Supreme Lord immediately replied, 'So be it!' and disappeared. Even if taken the literal meaning of above text, it appears like the disc (Sudarshan Chakra) and Kartavirya Arjuna don't have any relation. Not the answer you're looking for? Browse other questions tagged mythology vishnu puranas parashurama narada-purana . What is the power of Narayana Kavacha mantram?